A guidebook to the Cape Wrath Trail, a long-distance trek through the Scottish Highlands from Fort William to Cape Wrath. The Cape Wrath Trail is a 230 mile, 3-week challenge through wild and magnificent landscapes, such as Morar, Knoydart, Torridon and Assynt. Crossing such empty country, it is for the experienced backpacker only. The essential guidebook to the Cape Wrath Trail, a long-distance trek from Fort William to Cape Wrath crossing the wild north west of the Scottish Highlands. The route is described from north to south in 14 stages, with 6 alternative stages along the way, allowing for a flexible itinerary of between two and three weeks. A long tough trek with no waymarking, this is for the tried and tested backpacker. 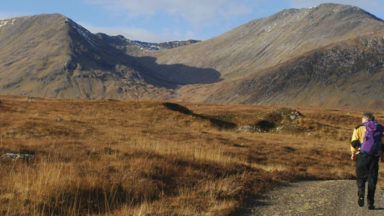 The Cape Wrath Trail is regarded as the toughest long-distance route in Britain and offers unparalleled freedom and adventure to the experienced and self-sufficient backpacker prepared to walk for many days in remote wilderness. Travelling through the wild and rugged landscapes of Morar, Knoydart, Torridon and Assynt, to the peaks of Arkle, Foinaven and Ben More, and a dramatic finale at the Cape, it will test the limits of your endurance. But for those who are up to the challenge, the rewards are a chance to experience a solitude rarely found in modern life and to explore the beauty of these truly wild landscapes. This guidebook includes OS mapping, route profiles and detailed route descriptions and gives you all the information you need about accommodation (including hotels, bothies, B&Bs and bunkhouses), campsites and amenities en route, to help you plan and prepare for this epic challenge. 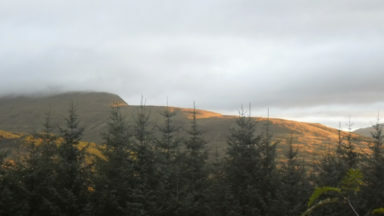 Getting from Maol Bhuidhe Bothy to Bendronaig Bothy, there are two clear possibilities - clockwise or anti clockwise. The guide prescribes the clockwise approach; but the anti-clockwise route is now much easier and locally recommended. The stalkers’ track shown as a dashed line on the Harvey Map on the east of Beinn Dronaig (but not followed by the red-lined path) has now been bulldozed well round the mountain so that from Maol Bhuidhe Bothy all you need to do is to go north across the river then head straight up the hill for about 500m and follow a 'motorway' track round to Loch Calavie and on to Bendronaig Bothy. 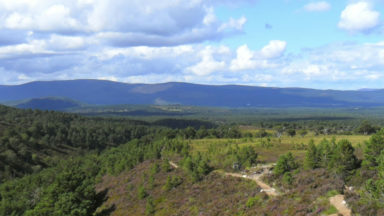 The long zigzags through the forest above Inverlael can be avoided if you simply continue along the forest track from 191854 to 204853, then follow it north round the bend, you can pick up the minor track zigzagging up the hill (shown on the Harvey Map but not on the map in the Cicerone guide) from 206856 to 206858 and then re-join the major track up the hill and out of the forest. This three-week wilderness trek is for ambitious, experienced backpackers, but it is made all the more comfortable with Harper's comprehensive and compact trail guide. 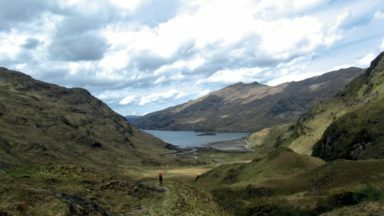 The Cape Wrath Trail in Scotland's remote north-west is believed by many to be the most difficult long-distance footpath in Britain. 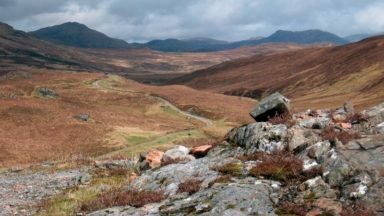 Without waymarkers and often entirely trackless, "it's not really a trail at all" says Iain Harper in his guidebook, "more a jigsaw of routes between Fort William and the most northwesterly point of mainland Britain". The way passes Morar, Knoydart, Torridon, Assynt and Sunderland, through swollen rivers, rugged mountain passes, deep bogs and forested glens. "Dark, boggy moments are quickly forgotten amid a solitude and beauty rarely found in modern life," he writes. This three-week wilderness trek is for ambitious, experienced backpackers, but it is made all the more comfortable with Harper's comprehensive and compact trail guide. Presented in 14 stages with six alternative routes, the book is packed with practical details - of bothies, campsites, resupply points, terrain and weather conditions. OS maps of the trails are complemented with altitude graphs, while its splash-proof pages and small print size make it both durable and lightweight. Harper has walked the 230 mile trail many times and his guidebook reflects his love for the way. "Try to hold on to some of the sedate pace of the wilderness, remembering the simple pleasures of getting from one place to another, surviving and traversing a landscape that has existed since time immemorial," he pensively concludes. 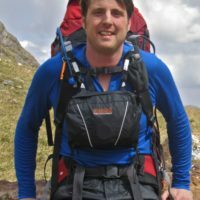 Iain Harper completed the Cape Wrath Trail in 2009. 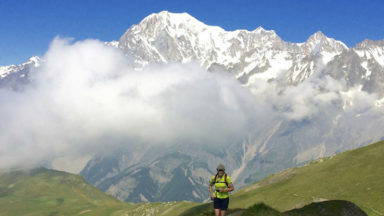 Armed with his research he approached Cicerone to write the definitive guidebook to the trek. Iain has walked extensively in the Highlands for 20 years, enjoys running ultra marathons and lives with his wife Kay in the Cotswolds. Up for a challenge? Then the Cape Wrath Trail could be just what you are looking for.